Home / Uncategorized / 3 Day Until Christmas Day – It is getting down to the LAST MINUTE! 3 Day Until Christmas Day – It is getting down to the LAST MINUTE! 4 Days Before Christmas! Last Weekend Before Christmas is more like it! Are you Ready? Let Premier Rental Purchase help you get home ready for guests, family and friends this Christmas holidays with our great line up of Furniture, Appliances, Electronics and Computers. Give us a call at Dayton West 937-278-2000 or Dayton East at 937-256-6000. 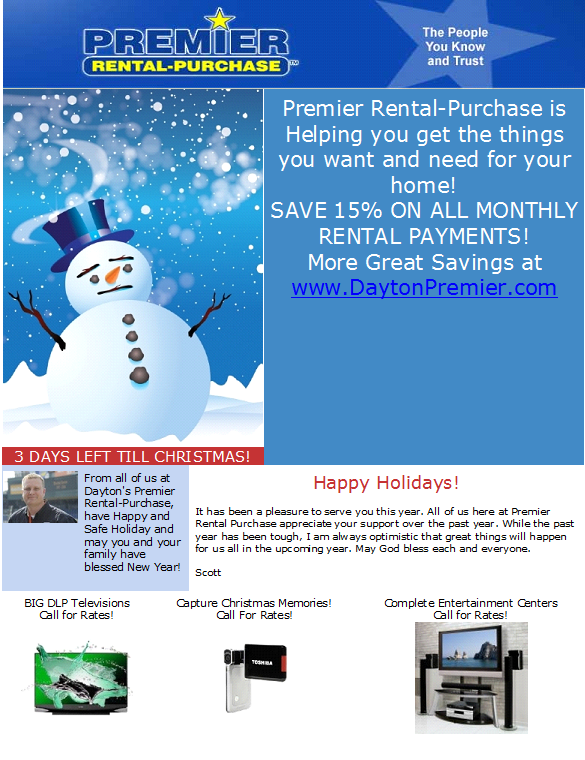 Previous post: Premier Rental Purchase: 4 Days Left Until Christmas!